A Canadian soldier who was shot outside the war memorial on Parliament Hill in tended to in Ottawa on Wednesday. A gunman opened fire at Canada's National War Memorial on Wednesday, killing one soldier, Ottawa police said in a statement. Witnesses in the Canadian capital, Ottawa, say the gunman then ran into the main Parliament building, where dozens of shots were fired. Ottawa Police say "a male suspect has been confirmed deceased," but it's unclear how that suspect died or if he died at the Parliament building. The incident comes after the country raised its terror threat level from low to medium and two days after two Canadian soldiers were run down — one of them killed — in Quebec by a man who reportedly had jihadist sympathies. In a televised address to his country, Canadian Prime Minister Stephen Harper said over the next few days "we will learn more about the terrorist and any accomplices he may have had." But this attack, as well as the one earlier this week, shows that "Canada is not immune to the type of terrorist attacks we see elsewhere." Harper, however, said that this will not intimidate his country. Instead, Canada will redouble its efforts against terrorism, he said, and make sure terrorists find "no safe haven." During a press conference, Ottawa Police Chief Charles Bordeleau said this is still an "ongoing investigation" and asked "people to stay away from [Ottawa's] downtown core." Bordeleau was asked if police were still looking for other suspects, but he would only say that authorities are sweeping Parliament Hill to make sure it is safe. Bordeleau and an official for the Royal Canadian Mounted Police, which is in charge of investigating what happened on Parliament Hill, said it was too early to assign a motive to the shooting incident. Even after the sun set, Parliament remained locked down. This is a breaking news story. We'll update once we know more. And as we always tell you when stories like this are developing, information may come in that later turns out to have been incorrect. We'll do our best to sort through what's out there and reliable and update as needed. Ottawa Police say they have lifted the security perimeter they had drawn around downtown Ottawa, because they have "determined that there no longer exists a threat to public safety in the area." Parliament Hill, however, "continues to be off limits to the public." "Canada will never be intimidated," Prime Minister Stephen Harper said in an address to the nation. "We will redouble efforts to fight terrorist organizations... they will have no safe haven." Harper said that over the coming days the country will learn more "about the terrorist and any accomplices he may have had." But this attack and the one that happened earlier this week, Harper said, shows that "Canada is not immune to the type of terrorist attacks we see elsewhere." Ultimately, Harper said, "Canadians will pull together." Citing Canadian and American sources, The New York Times, CBS News, NBC News and the CBC say the suspected gunman is Michael Zehaf-Bibeau, who was born in Canada in 1982. The New York Times reports that Canadian officials shared details about Zehaf-Bibeau with American authorities but "by midafternoon Wednesday, the officials said, a search of F.B.I. databases had not come up with anything about the assailant." The CBC reported that Zehaf-Bibeau had "a criminal record in Quebec dating back 10 years on some drug-related charges." NBC News reports that Zehaf-Bibeau changed his name and he used be called Michael Joseph Hall. "Authorities told NBC News they believe Hall had a string of low-level criminal offenses in the past but that they had uncovered no links in the U.S. with anyone being watched in connection with terrorism investigations," NBC News reported. The Canadian Senate is expected to return to work at 1:30 p.m. ET. tomorrow as scheduled, Joanna Smith, a reporter for the Toronto Star, reports. Canadian Prime Minister Stephen Harper will address his country at 7 p.m. ET. The CBC is streaming its live coverage here. The soldier killed in today's attack is Cpl. Nathan Cirillo, a 24-year-old reservist from the Argyll and Sutherland Highlanders of Canada regiment. "Gut-wrenching to hear the soldier guarding our national war memorial has died. Rest in peace Cpl Nathan Cirillo," Canadian foreign minister said in a tweet. "Cirillo was a former Good Life fitness employee. Michele said he also loved country music and had two German shepherds. He joined cadets when he was 13 years old." Ottowa Police say they have reduced the size of the safety perimeter in downtown Ottawa. That said, there are still quite a few buildings that are still on lockdown. Police added that two other people were injured during the shootings today, but their injuries were not life-threatening. Speaking to a pool of reporters at the Oval Office, President Obama said this situation is "tragic." We don't know what motivated the shooting or if it was part of a broader network play, he said, but "it emphasizes the degree to which we have to remain vigilant when it comes to dealing with acts of senseless violence or terrorism." According to a White House readout, President Obama talked to Canadian Prime Minister Stephen Harper to "express the American people's solidarity with Canada" in light of today's attack. "President Obama condemned these outrageous attacks, and reaffirmed the close friendship and alliance between our people," the White House readout of the conversation said. "The President offered any assistance Canada needed in responding to these attacks." Speaking at a news conference, Ottawa Mayor Jim Watson said what happened today is "beyond expression." "This is a sad and tragic day for our city and our country," Watson said. He added that even though we still don't know what prompted this attack, he was angry. "But I will not let that anger rule the day," Watson said. 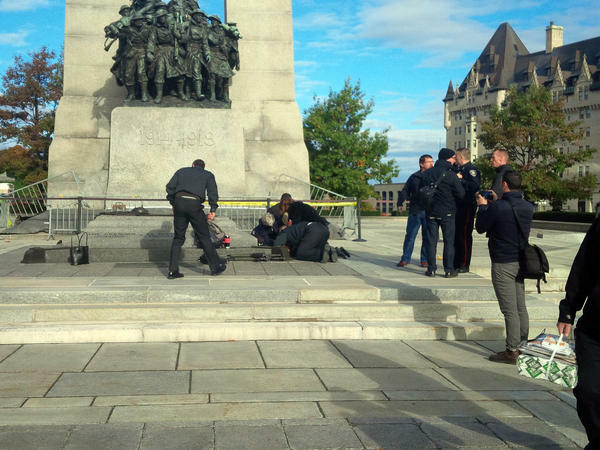 In a press release, Ottawa police say today's incident happened near the National War Memorial and on Parliament Hill only. Earlier, there were reports that shots were fired near Rideau Centre Mall. According to Ottawa Police, the shooting started at the National War Memorial, where one soldier was killed. There was another shooting incident at Parliament and police say one male suspect was deceased. It's not clear whether he was killed while trading fire with police at the Parliament building. On its Twitter feed, Ottawa police say one victim — a member of the Canadian forces — was killed in the incident. We'll know much more at 2 p.m. ET., when the Royal Canadian Mounted Police brief reporters. CP24 is live streaming its coverage and so is the CBC. During his regularly scheduled press briefing, White House Press Secretary Josh Earnest said President Obama has been briefed on the matter in Ottawa and will at some point talk to Prime Minister Stephen Harper. Earnest said Canada is one of the United States' "closest friends and allies," and administration officials have been in touch to offer any support. Earnest was asked if this was a terrorist attack, and he said he was not in "a position to render judgement on that at this point." CNN interviewed Peter Henderson, who said he was locking his bicycle near the memorial when the initial shooting took place. "I heard four shots, turned around and saw the soldier laying on the ground," Henderson said. "People fled Parliament by scrambling down scaffolding erected for renovations, witnesses told the Canadian Press news agency," The Associated Press relays. The CBC reports that "Ottawa Civic Hospital confirmed two people have been taken to hospital with non-life-threatening injuries, one with a gunshot wound." Reuters quotes Canadian television as saying that Prime Minister Stephen Harper is safe. The National War Memorial is located in the heart of the Canadian capital near the Parliament buildings. "Scott Walsh, who was working on Parliament Hill, said he saw a man running with double-barrelled shotgun, wearing a scarf and blue jeans. "Walsh said the man hopped over the wall or fence that surrounds Parliament Hill, with his gun forcing someone out of their car. He then drove to the front doors of Parliament and fired at least two shot, Walsh said. "Police said the man was not yet in custody."